Khizr Khan and his wife Ghazala exploded into the national consciousness during the 2016 presidential elections. Invited to speak at the Democratic National Convention by Hilary Clinton’s campaign staff, Khan was only expecting to pay tribute to his son, Captain Humayun Khan, killed in Iraq. His speech, however, was electrifying, and his action of taking out his pocket Constitution to offer it to Donald Trump was nothing short of brilliant. 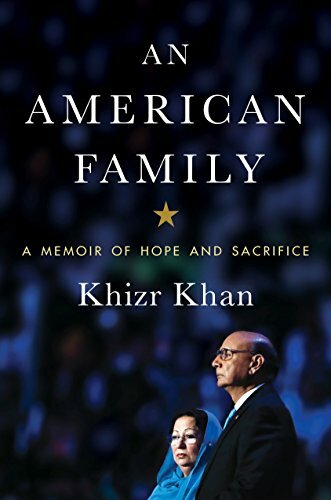 Khizr Khan’s memoir An American Family talks about that moment at the DNC and about his son in general in the last few chapters. However the bulk of the memoir is a roadmap to his life, and the life of every immigrant who arrives on America’s shores with the hope of a better future. In this book there is a heartwarming message to all Americans: that our diversity is what makes us stronger and more beautiful a nation. Like Khan, millions of other immigrants are attracted by our freedoms and values and want to be part of the American dream. Khan traces his attraction to America to his college days in Pakistan, when he read the American Constitution and was amazed at the rights awarded to its citizens. Growing up a third world country under martial law, this son of a poor farmer had no opportunities and worse, no dreams. He knew that rich people got everything, and poor people got nothing. He knew that his station in life didn’t depend on how hard he worked but how much he was willing to be dishonest, unethical, or perhaps even criminal. It is a harsh look at Pakistan, but one that is accurate. In his early life, Khizr did not think he could ever live in the United States. That country was a mythical land he could only wonder about: how its citizens declared their freedom, how they fought for their rights, and how those rights were enshrined in their Constitution. Still, he knew as he grew older, fell in love and married Ghazala, that living in Pakistan was not an option. He studied law, but to become a successful lawyer he would have had to do all sorts of unethical acts. He left for Dubai to make a better living, and there, too, did not find comfort. Soon his wife joined him and they started a family. Khizr’s dream began to come true when he was accepted to Harvard’s law program. The young family decided to emigrate to the U.S. and for several years struggled financially before being able to afford Harvard’s tuition. Their story of struggle is not uncommon: every immigrant who reads this book will recognize those years of saving every dollar, eating from garbage dumps, and sleeping on park benches. Khizr took it, not as a disappointment, but as a fulfillment of the American dream, for he knew that these struggles would bear fruit one day. The memoir is not only full of Khizr’s struggles but also of stories that warm the heart: strangers who helped him along the way, offering him a place to stay because he was homeless, bringing his family food on their first day in a new land, or helping him with his career. He accepts these strangers’ help as a sign of God’s largess on him, and of the fact that indeed Americans are kind and generous. This, he feels, is our country’s best quality: this adherence to human values regardless of our diversity. The memoir follows him in his life’s journey. He and his wife raise three sons, and the middle one—Humayun Khan—joins the Army. After only a few years, he is killed in Iraq trying to stop a suicide bomber, and is awarded the Purple Heart and the Bronze Star. Despite their grief and shock, the become Gold Star parents, the highest honor the U.S. military can bestow on them. The memoir takes a somber tone as Khizr describes the years after his son’s death. An American Family is a practical tale of one man’s life as he works to improve himself and his family’s lot in life. But it is also a testament to family values and love: throughout the book are snippets of teachings Khizr gained from his grandfather—the man who raised him—and from others he was impressed by, including the poet Rumi. There are discussions of God, of democracy and how best to lead a full life. There are descriptions of martial law in Pakistan, and the contrasting descriptions of freedom in the United States. There are analyses of Islam and how it fits so well into American values despite what critics say. And finally, there are those small, family moments that unite us all regardless of race, religion and country of origin. Khizr Khan is a dynamic personality who captured the American public’s imagination as someone who knew and loved this nation as much an anyone who was born here. His anger at Trump’s disregard for the Constitution was palpable that night at the DNC. This memoir An American Family is a testament to that anger and a vivid, engaging explanation of how the son of a Pakistani farmer became such a staunch patriot of the United States. Saadia Faruqi is Pakistani American author of the short story collection Brick Walls: Tales of Hope and Courage from Pakistan. Her writing has appeared in such venues as Huffington Post and The Islamic Monthly. She is also an interfaith activist and speaker.